While there is significant potential for Water Funds to provide benefits to investors, communities, and nature, these benefits are not guaranteed by the creation of a Water Fund. Clear goals and monitoring data are the foundation through which science-based, sound investments are made and validated. 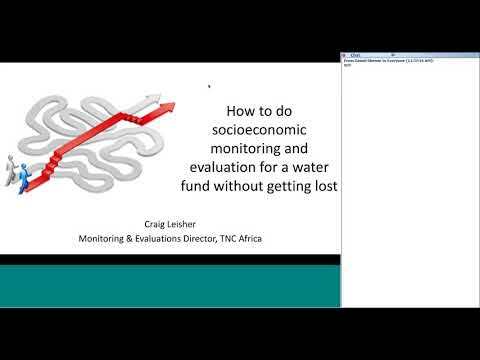 Why is monitoring important to Water Funds? Paulo Petry from The Nature Conservancy describes the importance of monitoring and evaluation. Why do we monitor Water Funds? We monitor Water Funds to observe, record, compare, track, discover, and adaptively manage the projects we are implementing (often referred to as Implementation Monitoring). You may learn new ideas without monitoring, but cannot monitor without learning. Alongside the implementation of pilot projects, monitoring is critical for testing the effectiveness of interventions through approaches such as edge of field monitoring. We monitor Water Funds to achieve our goals / outcomes (often referred to as Impact Monitoring). Clear goals and monitoring data are the foundation through which science-based, sound investments are made and validated. Financial supporters require regular reports on returns of investment and progress, participating communities require evidence of the proposed benefits, and Water Fund managers require information to strengthen models and adapt management practices to changing environmental and socioeconomic conditions. Accordingly, robust monitoring programs are essential for validating that a given Water Fund is generating the environmental, economic, and social impacts it was designed to produce and to identify challenges and adapt the approach to address them. Why is linking monitoring results to decision-making important? Can you share a few examples of the types of monitoring that are currently being implemented in Water Funds? Watch this WFN webinar to learn more about monitoring costs, best practices, and data management.